See KBJR website for original story. 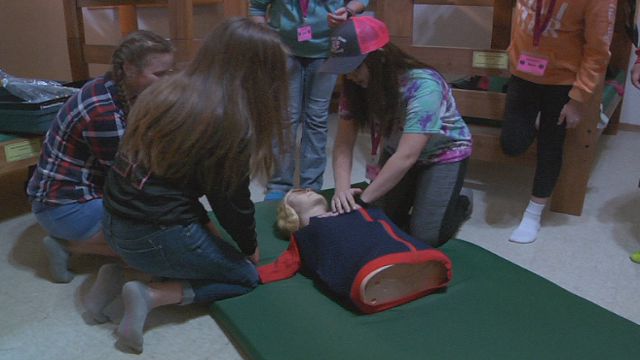 Deep in the backwoods of Northwest Wisconsin, Rescue Divas EMS Camp has begun their third year of teaching young girls hand-on activities that focus on a variety of skills and knowledge needed in Emergency Medical careers. Along the gravel back roads Camp Northwoods, the Troop House is filled with Rescue Divas, learning a new trade. “It came about because we realized we have a shortage of EMT’s in our area,” says Camp Director, Carrie Okey. Rescue Divas is a five day EMS camp where young girls are educated in skills such as CPR and first aid. Twenty middle school-aged girls are accepted into the camp program. Camp officials try to have girls from a variety of counties across Northwest Wisconsin. Counties including, Ashland, Bayfield, Burnett, Douglas, Iron, Rusk, Sawyer, and Washburn. The program is funded with the help of Northwest Wisconsin Area Health Education Centers and other organizations. Okey claims that women are underrepresented in this line of work and it’s important to make them feel like they can excel in a medical career. The campers went through a CPR scenario on day one and will re-do the scenario on the last day to show how much they have learned.